Located within the Normanton sports Acro at 26 Wakefield Road, Normanton, Wakefield. West Yorkshire. WF6 2BT. The Normanton Academy has been running since opening in 2010. Now open 3 evenings a week offering karate tuition from the age of 4 and kickboxing tuition from the age of 7. The Chuldow Normanton Academy is the premier Academy in the area, servicing children and their families in a fun, professional environment. Not only do we offer martial arts skills, but also a unique Ready For Life Programme that is designed to create better, stronger adults. 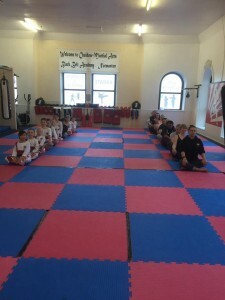 Chuldow Normanton runs Karate & Kickboxing classes on a Monday, Wednesday & Friday for children & adults of all ages & abilities, and this full time location has all the equipment needed to provide you with all aspects of Martial Arts training. Mr & Mrs Durham are fully trained, certified instructors who hold enhanced DBS checks.